This week’s theme is: Challenge! Been a great first year! Raise a glass, friends… Cheers! It’s Challenge Day, and our first Haiku-versary! The Challenge for our Haiku-versary is to bring in the most new Haiku-ers (“new” meaning never participated here before, and ideally people who will join us and stick around!). Please have your new Haiku-er identify themselves as coming from you in the comments, and use the proper graphic and link (below) on their blog. 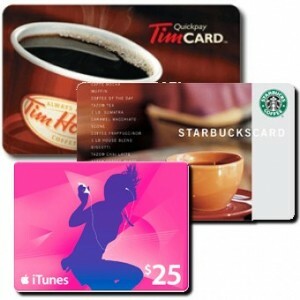 The winner* of our challenge will get their choice of a $25 gift card to Starbucks, Tim Hortons, or iTunes, and be announced with next week’s haiku! * standard legal mumbo-jumbo… void where prohibited by law (we’ll figure something else out in this event). 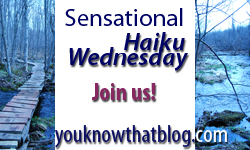 To be eligible for this challenge, referred new haiku-ers must have a “real” blog, in existence for at least 6 weeks prior to this challenge, be new to this meme, yadda yadda yadda. Common sense stuff. Ask me if you’re not sure :) This haiku Challenge ends at 11:59pm EDT (Toronto/New York/my time) June 23, 2010. I hated to be first but got to get some sleep so I can pack up my suitcase in the morning after my dental appointment. Senry?, don’t know how the “?” sneaked in. Senryu, now I know. WordPress doesn’t like the “-” (long vowel sound) over the letter. Happy Haiku-versary! Looking forward to even more joyful years. Thanks for hosting this wonderful meme. Have a wonderful day. i want to wish you a very happy Haiku-versary. What a year it has been for you I’m sure with this. I’m glad that I found you. Not only is SHW one of my favorites but getting to know you more has been a great pleasure as well. :) Good luck to all with the contest. Brilliant on your part my friend :) I’ll be anxious to see who wins next week. Happy Haiku-versary – love the new badge too! I’m not sure how many people will join in from my place this week I’ll just have to wait and see. Thanks for hosting this every week too, it’s always fun, sometimes silly and sometimes thought provoking. Yea! It’s party time! I sent out invitations and hope many will RSVP and attend the festivities! Oh, and I like the new logo! Looking mighty fine! Sorry! I woke up this morning thinking (or dreaming) of the one I lost. I hope this Haiku is not too dark. no my love, for not with thou. My soul has deferred once more. With it went the heart. I’m wondering what has become of the other two? Knarf: This is a beautiful piece; thank you so much for crafting and sharing it with us all! I’ll get you linked up Larry, not to worry! I’m back!!! Toss me an email please, I needs to ask you a question!! We’ll find cures for all of it. Yes: challenge me; challenge us. Well done, as always, J-B! Cheers! Congrats on the Haiku-versary! I’ve been on a hiatus lately, but I had to stop by to say hi! That is beautiful. Thank you for sharing that. An up and down road for us? It’s worth it to try…. Have a fantastic week, all!! Sorry I am late Jenn! At least I made it this week. I am running as fast as I can in my little squirrel cage! Welcome! Amanda mentioned you might stop by :) Also said you might be blogging soon – be sure to stop back when you’re set up and I’ll come visit!